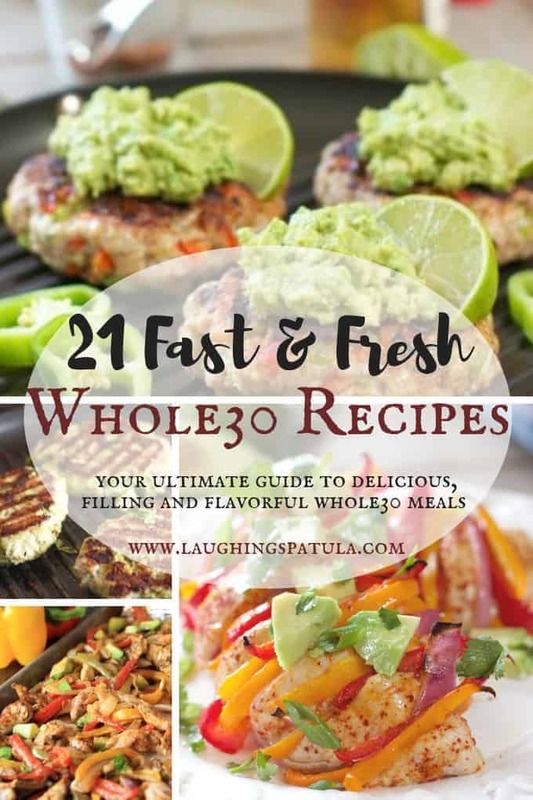 You are here: Home / Whole30 / 21 Fast and Fresh Whole 30 Recipes! 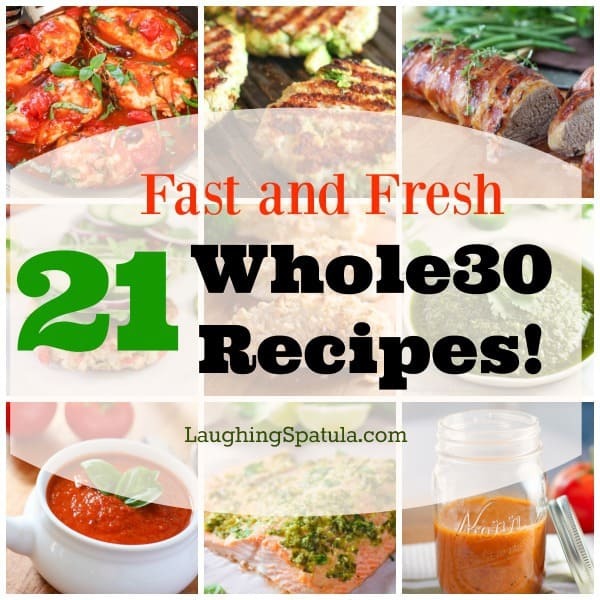 21 Fast and Fresh Whole30 Recipes! – You won’t believe you are on a healthy eating plan while eating these fabulous dishes! 3 weeks worth of Whole30 Dinners. So delicious you’ll forget they’re Whole30! 21 Whole30 Meal Recipes that are incredibly Fast and Fresh! What is a Whole30? Whole30 is a short-term nutritional reset, designed to help you put an end to unhealthy cravings and habits, restore a healthy metabolism, heal your digestive tract, and balance your immune system. Sounds lovely doesn’t it! Who wouldn’t want to look and feel better while you eat amazing food! (hand raised and waiving in the air!). I attempted my first Whole30 in January of 2014, I made it 23 days before falling into a vat of champagne at a Seahawks Super Bowl Party. Really, I think I blacked out or something. I can hardly remember it….hiccup. I’ve been waiting and waiting for a good time to attempt this again and isn’t January national diet month or something? If it isn’t, it should be! The Whole truth, pun intended, is, I struggle with my weight , and I have been on every diet available. (My husband and my check book will confirm this.) But this Whole30 thing speaks to me. First of all, it’s food I actually like. Savory food, fresh veggies and fruit. Second, it’s whole foods that are feeding my body and making it smile. And after the first week, I feel amazing! (notice how I said ‘after’ the first week…chubby fingers making quotation marks. First week wasn’t much ‘fun’). And finally the third reason, umm, lets see, …oh weight loss!…silly girl. Yes, weight loss is a beautiful thing! The toughest part of the plan, outside of the no wine thing, is ‘what do I eat on a Whole30? !” I am here to help with a plethora of easy to prepare recipes you can have for Meal 1, 2 or 3. So flavorful your family will never know what him ’em! I have a few more on the blog and you can view them all here. Also, the majority of my recipes make enough to feed a family of four with leftovers for your lunch box, which is a real win win when on the plan.
. It’s relatively inexpensive for what you get. Hard bound, glossy beautiful pics for around 18 bucks, cheaper if you go E-book. (I have both…throw some money at it and maybe it will stick right?). UPDATE: There are new cookbooks out! Penned by the founder of the Whole30 Program, Melissa Hartwig. These books should make your Whole30 a whole bunch easier! all I need and more. Also, checkout the Whole30 website and blog for an active community board. Love that community board, it was a real life saver for me, well it was, until I hit the vat of champagne…ugh. So here goes! Clink!..oh wait, there is no clink in Whole 30. Thud? (the sound of Chicken Avocado Burgers colliding!). This post may contain affiliate links, which means I might receive a very small commission, at no additional cost to you, should you chose to purchase that linked item. I only link to items I know and trust. Thank you! All are incredibly easy to make, fresh and fast! Sheet Pan Fajitas! 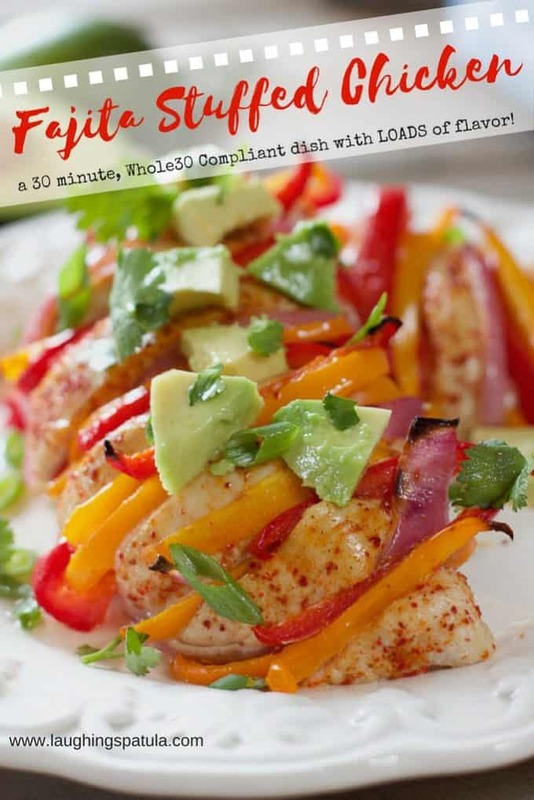 This is my all time favorite, go too, gotta eat it Whole30 recipe! You can top a salad, wrap it in lettuce leaves or just it straight off the sheet pan! 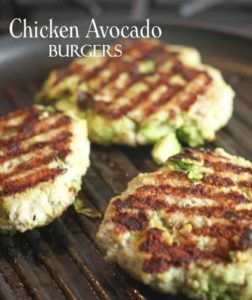 Chicken Avocado Burgers The most popular recipe on this blog and for good reason! 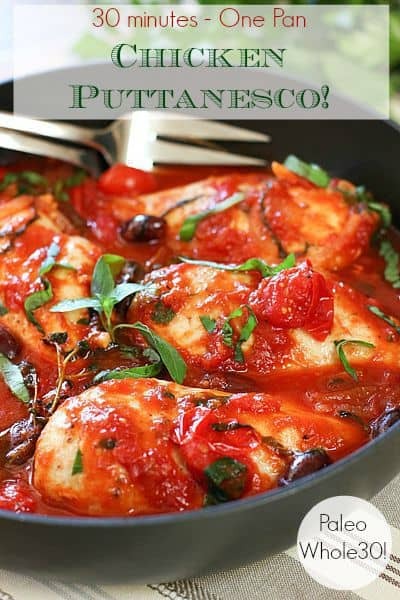 Chicken Puttanesca Super big flavor…done in 30 minutes! 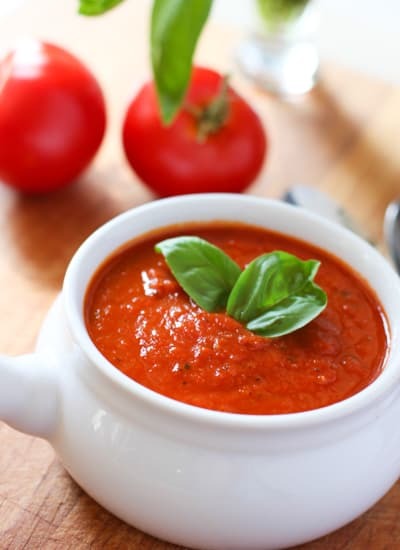 Tomato and Roasted Red Pepper Soup – Lunch bag! Oh ya! You need a double batch for lunch! Fajita Stuffed Chicken– This easy to make 30 minute chicken recipe offers BIG flavor and fabulous color. Perfect for any season, you’ll love how impressive this looks but how easy it is to make! 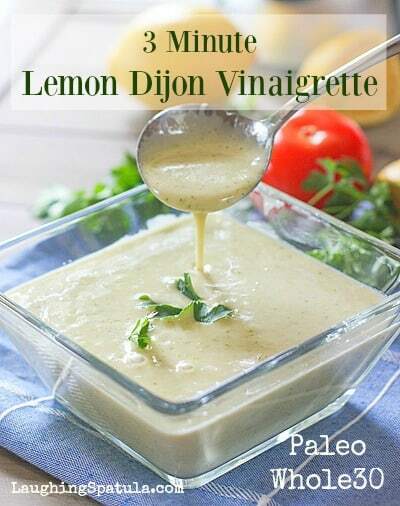 3 Minute Lemon Dijon Vinaigrette– You will make this over and over again! I use it on salads and to marinade fish and chicken! 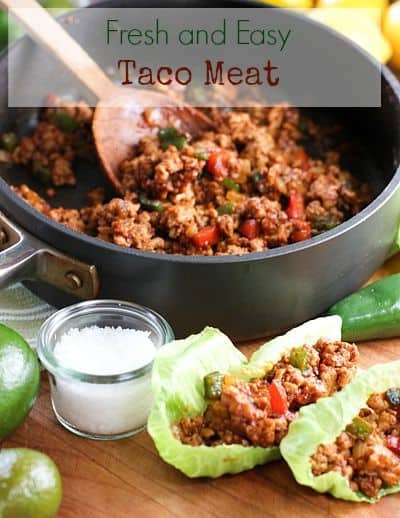 Fresh Taco Meat – We make this every week and eat it on salad for lunch. I pump it up with all kinds of veggies and spices! 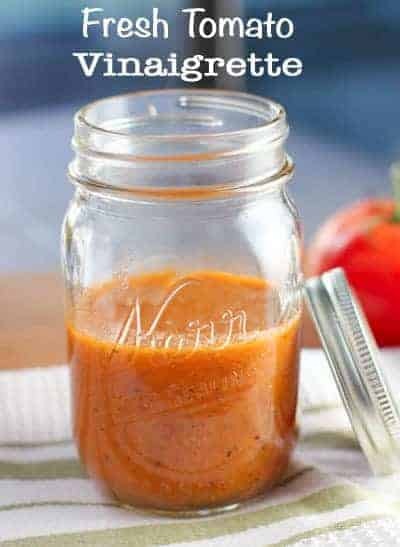 Fresh Tomato Vinaigrette – Such a great dressing. Simple and fresh! Slow Cooker Bolognese – Ground beef, tomato puree for a meaty, unbelievable flavor! Fill your freezer with this! Serve over spiral zucchini or veggies! (ignore the dribble on the container in the back…I need a photo editor!). 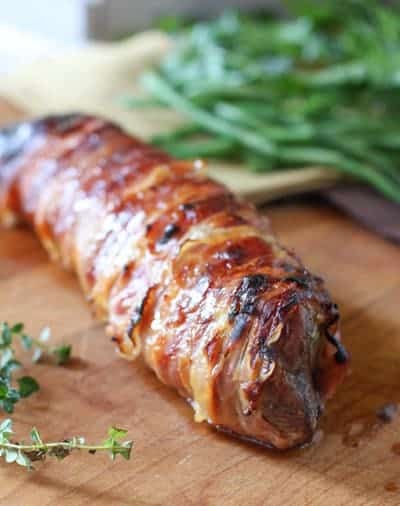 Prosciutto Wrapped Pork Loin – Perfect for Saturday date night! Looks so fancy but it’s only a couple ingredients! 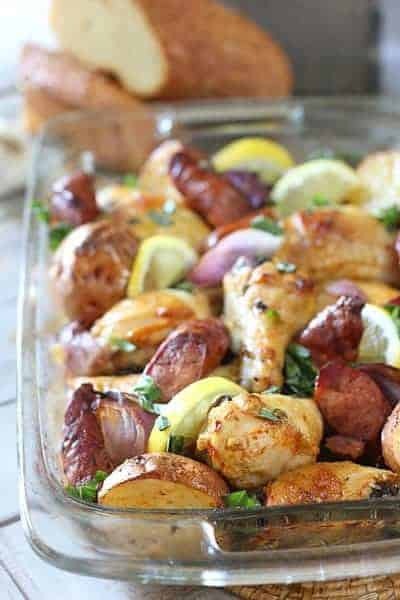 Roasted Chicken Sausage and Potatoes – All in one pan! This is over the top easy and so good. Make sure your sausage is compliant. 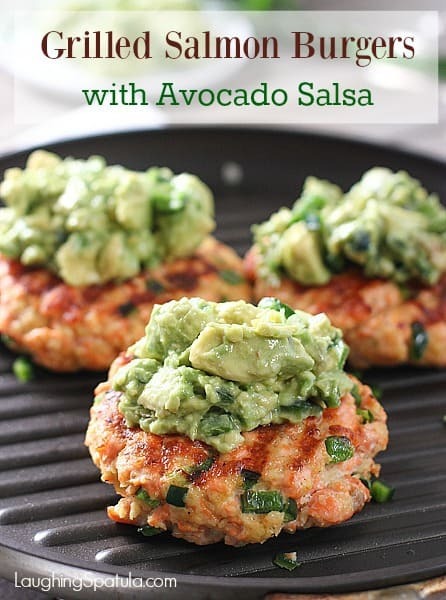 Salmon Burgers with Avocado Salsa – Chopped salmon with herbs and almond flour to hold it all together. Topped with my favorite Whole30 condiment…avocado! 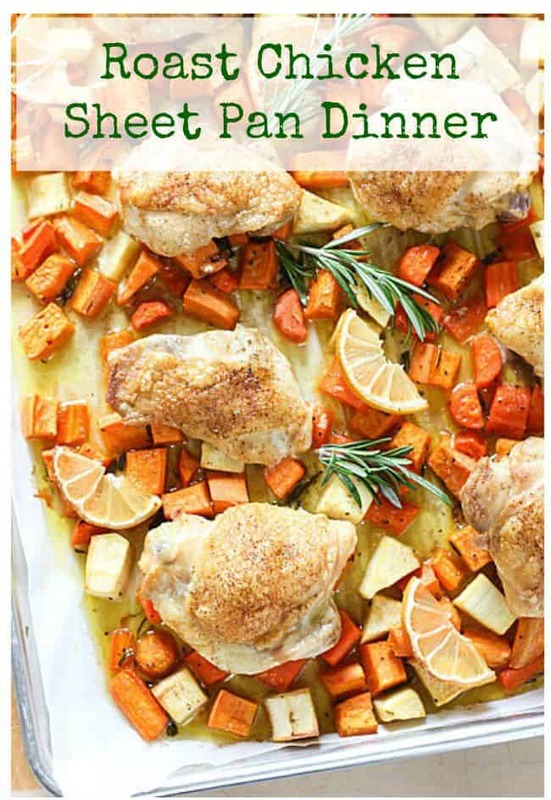 Roast Chicken Sheet Pan Dinner – Work night dinner done! Toss your meat and veggies on a tray. Bake for 40 minutes and you have a fabulous meal! 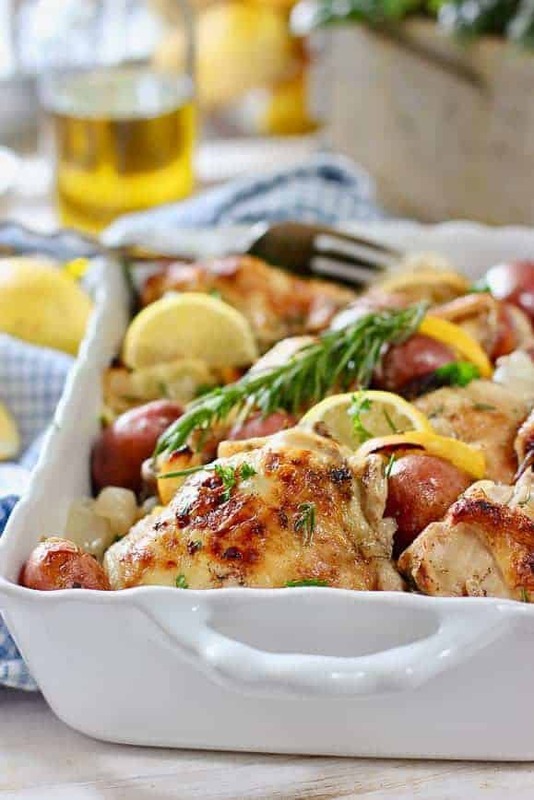 Chicken, Rosemary and Potatoes – One Pan Dinner – Another Whole30 compliant one pan wonder! 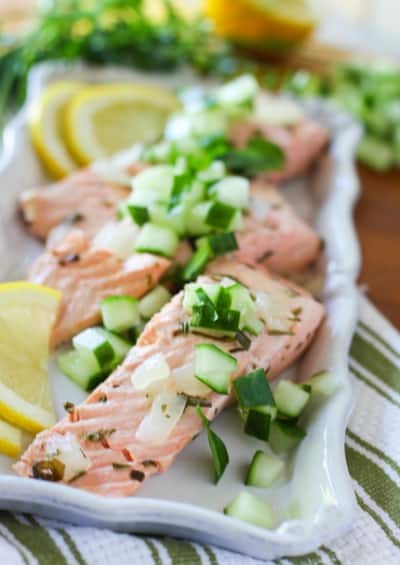 Cold Poached Salmon – Don’t wait until summertime to try this! It’s fabulous for lunch and breakfast! 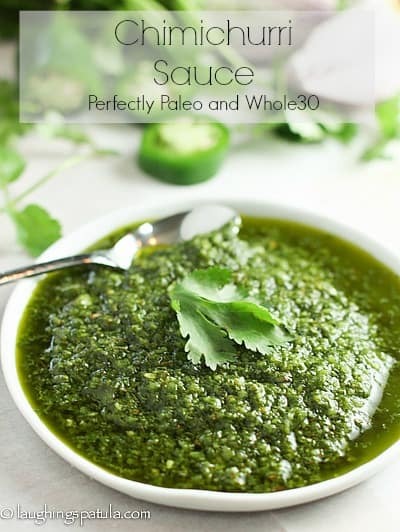 Chimichurri Sauce – High flavors – easy prep condiment! 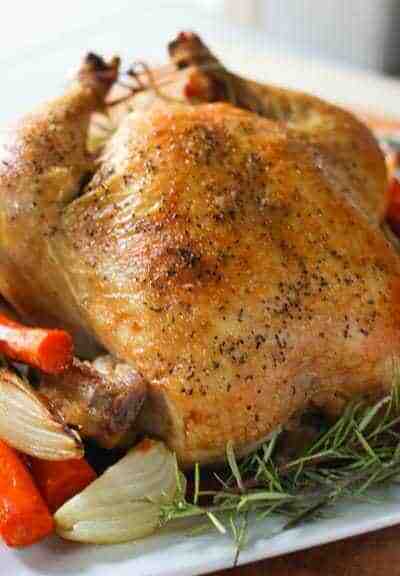 Easy Roast Chicken – Sometimes the basics are the best. You can live off a chicken for days! 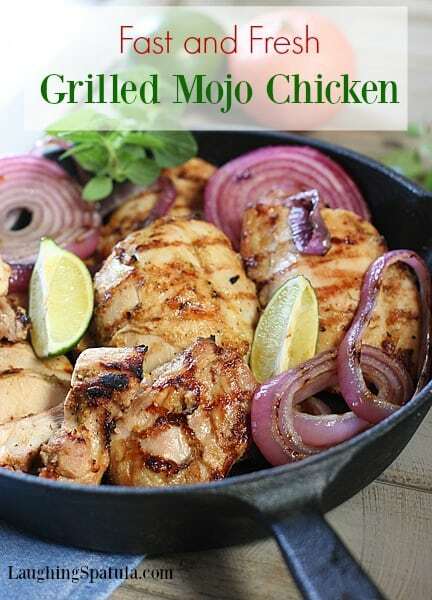 Mojo Marinated Chicken- Quick marinade makes this a perfect weeknight meal! 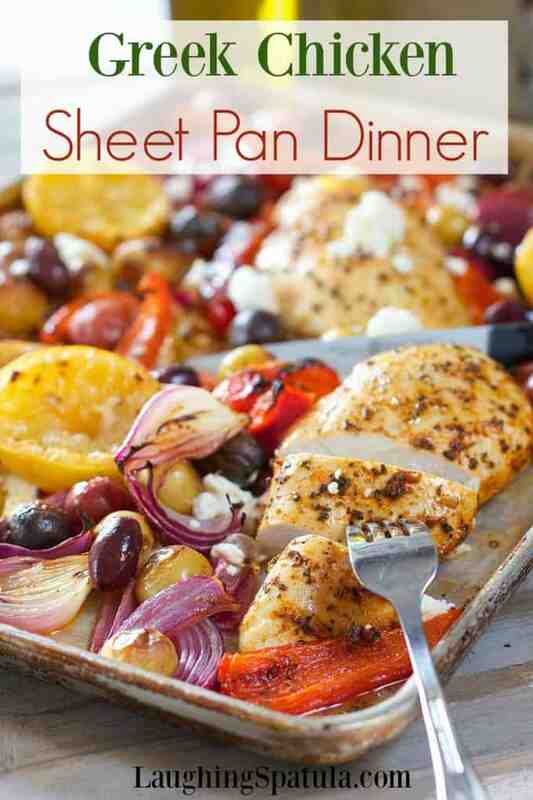 Greek Sheet Pan Dinner – I know! It has a sprinkle of feta.. not compliant! OMIT THE FETA! This recipe, without the feta is a Whole30 dream! Will make this again soon, and include a pic without the feta but in the mean time…enjoy feta free! 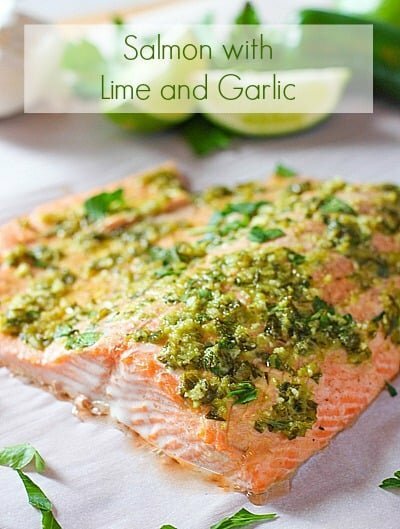 Salmon with Lime and Garlic – 10 minutes prep time and Whole30 big flavor! 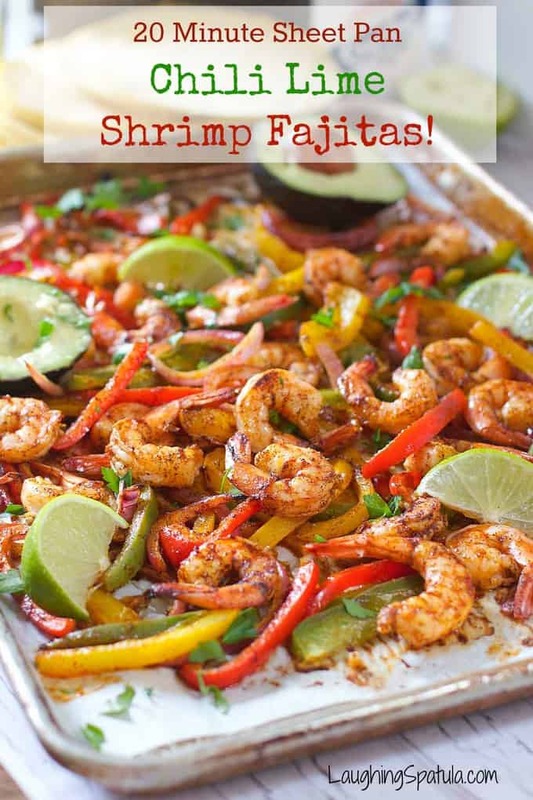 Chili Lime Shrimp Fajitas – Really, not kidding…20 minutes and dinner done! Bonus Recipe! Sheet Pan Marinara Sauce! 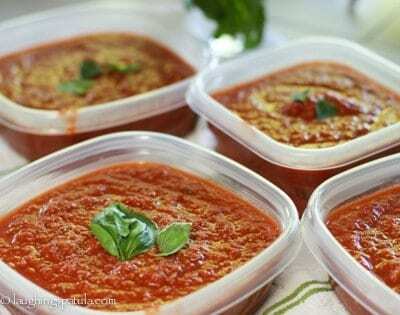 This incredibly flavorful marinara is a cinch to make and so much fresher than the bottled stuff! Best of luck to you on your Whole30! Stay strong…it gets easier! Are you just starting your Whole30 journey? Have questions? Comment below! Don’t forget to like us on Facebook, and connect with us on Instagram and tag your @Laughingspatula recipes with #laughingspatula, while you’re at it…We love to see your pics! I thought Whole30 is not dairy, how come you have a recipe with feta? Hi Nevena! I know! I put in bold, right on top of the pic…OMIT FETA! It’s just such a good recipe without the feta I wanted to share. Thanks for your nice note….have a great day! I’m preparing to start the whole 30 and I’m so grateful for you’re EASY and quick recipies. I stumbled across your website while on day 25 of my whole30 and in serious food boredom. 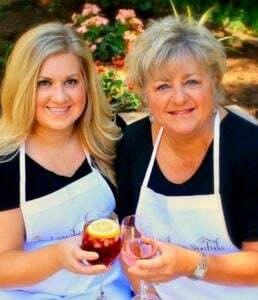 Thank you for putting together so many great recipes. I look forward to sheet pan fajitas tomorrow night!! Thank you Kristina! What a nice note to get! 5 more days for you…lots to be proud of! After looking at all the recipes above I actually used your link to AMAZON and ordered the book!!! I must have it and in the meantime will tying out a few of these selections. my husband is recovering from a heart attack and open heart surgery and we both need to lose some weight and this really looks like a way we can get on track and basically just follow it for the month and I am going let you know how it all goes…thanks and by the way love love love your site!!! What a nice note! Thank you Lisa! Good luck with your Whole30…I really think it’s the best program and to be honest, I need to do another one :)! Household )Mom, Dad & 27 yr old daughter) are on day 9…..we are loving it. I think we need to cut back on portions and fruit. Everything is so delicious. My husband already lost 10 lbs. I t is more money and prep time, but my motto is pay now or pay later (with doctors bills & loss of time living), it’s an investment. Having the whole house doing it makes it a lot easier. I don’t miss the bread or the dairy, maybe the grain and beans a bit, but I’m excited to see how my body reacts during the re-introduction phase. Hi Tina! How great that your whole family is on it! Makes it so much easier. I really like the food on Whole30 as well, its kinda how we eat around here any way. (sans the wine and cookies :). Considering another Whole30 in Sept. I need to wrap my mind around it! My husband and I did the Whole30 then we did a Whole15. I have to say it was very difficult at first, and I wanted to give up, but I love to cook and was curious to see how I would feel afterwards. I had some inflammation issues and thought I would give it a try. I have learned so much about food on this program and I feel great. You have to commit to at least 30 days. I loved finding your recipes, and now I have a Whole30 folder with all the wonderful foods to eat that are healthy and not so hard to make. 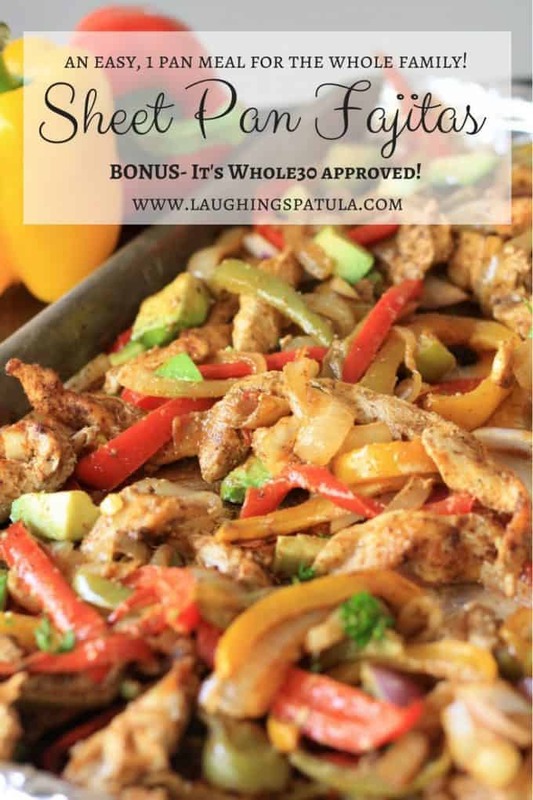 I think my favorite recipe on laughingspatula is the sheet pan fajitas. I have made the Shepards pie and that is delicious too. After the Whole30, I was able to “remake” alot of my own recipes to make them truly healthier. I learned alot on the program, and it was well worth it. I lost 12 lbs too! It is a great program and when you kinda wrap your head around the way it works it can change your eating habits for life! I seem to have a lot of slip ups during my ‘off W30 time’ :). Always trying to get back on track! Glad you liked the recipes and holy cow…12 pounds???! Way to go! Starting the Whole30 on Monday. Thanks for sharing the recipes. You are making it look so easy for prepping. Do you do any make ahead meals or freeze these for later? My daughter is joining the challenge with me and I cook up for both of us so she has easy meals to take back to her apartment and reheat. Thanks again for sharing! Hi Kim! The chicken avocado burgers freeze really well. Make a double batch and wrap individually for lunches and last minute dinners. I would eat the same thing one week then switch the following week. One week I’d make a double batch of taco meat and the next the fajita’s for big salads. Also the Chicken Puttanesca is really good for a big batch cooking and we would eat that for days! Good luck – it is a challenging program but well worth it! These recipes look great. We’re not doing the Whole30 plan, but these look good enough that I’d eat them anyway! Saving this list for later. Thanks for the nice comment Chris! They are all clean eating and mostly Paleo – I’ve yet to determine the diff between Paleo and Whole30…legumes? Potatoes? Not sure! I’m a year late, but the biggest differences between Paleo and W30, as far as I can see, is that on Paleo, you can have natural sugar subs, such as honey or coconut sugar, and Paleo allows SWYPO. Thats my fave too! Thanks for the note Laura! You can’t go wrong there! Thanks for the note! Hi Christine – It is a big commitment. 3 days and you will be at the worst part. If you can hold out for 27 more you will get the full benefits of the plan. Thank you for your note and please feel free to check back with me for encouragement! Actually, I think I need encouragement….It’s a tough plan! Happy New Year! I agree 100% . by day 5 it was smooth sailing for me . Im going into round 2 tomorrow. Do you have breakfast and lunch ideas ??? Hi Krystal! I did scrambled eggs with sweet potatoes a lot or just a helping of left overs from the night before. You get used to the dinner for breakfast idea pretty quick! Three days won’t do you any good, and more than likely, it’ll be offputting. If you can’t commit to the 30, this is prolly not the plan for you.